In August 2016, Intel introduced the first products in the 7th Gen Intel® Core™ processor family that provided leading performance and rich experiences for the new, immersive internet. Since August we’ve seen over 90 OEM systems ship to the market. Today, we welcome the rest of the family. What do 7th Gen Intel Core processors offer? More productivity. More speed. More responsiveness. More security. More immersive experiences. With over 40 new performance-class processors, these 7th Gen Intel Core processors and Intel® Xeon® processors based on Intel’s 14nm+ process technology power some of the best new laptops and desktops. This introduction on the eve of CES 2017 paves the way for an exciting year ahead. Keep an eye on many of our OEM partners. They will be introducing stunning and powerful new PCs for businesses and consumers. Increased performance and reliability: We know performance matters. It’s why we continue to focus on improved performance, delivering double-digit productivity performance increases – up to 20 percent for performance and gaming notebooks1,2 and 25 percent for desktops1,3. With 4K and 360-degree content – people can expect up to 65 percent faster performance on notebooks1,4 and 35 percent faster on desktops1,5. Our Intel® Core™ vPro™ processors have been the gold standard for commercial computing for over a decade. With the latest 7th Gen Intel Core vPro processors, business owners and IT managers can offer new PCs with up to 10 hours of battery life and 65 percent faster multitasking when compared with a 5-year-old PC1,6. And with many millennials today taking technology into consideration when choosing their workplace8, I’m confident the new 7th Gen Intel Core processor-based 2 in 1s and AIOs will delight them. 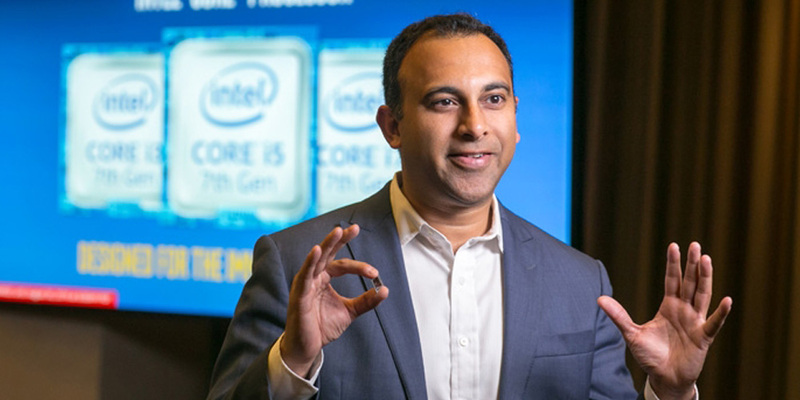 Be sure to visit the Intel IT Peer Network to read more on how 7th Gen Intel vPro processors are delivering new levels of performance, security and manageability to businesses. Enhanced Security7: 7th Gen Intel Core and Intel Xeon processors strengthen security with advancements in hardware-enhanced security and two-factor authentication built in to the silicon. For consumers, this frees up the hassles of remembering and typing in passwords. It also offers secure payments through fingerprint touch-to-pay. For the enterprise, our new Intel Core vPro processors, as well as Intel Core processors for business9, bring Intel® Authenticate7 as a hardware-enhanced multi-factor authentication solution. Intel Authenticate verifies user identity using a combination of hardened factors such as a PIN, a Bluetooth signal from your phone or a biometric identifier like a fingerprint, making your login a million times safer10. We are expanding our security partnership with Microsoft* and plan to integrate Windows* Hello and Intel Authenticate together for a seamless user experience. 4K UHD Entertainment: Thanks to the new media engine in all 7th Gen Intel Core processors, it is possible to stream 4K UHD movies and TV shows7 on services such as Netflix* on a computer for the first time. This means that critically acclaimed titles like “The Crown” and “Stranger Things” can be watched at home or on the go in brilliant 4K on your 7th Gen Intel Core computer. With the availability of other premium content providers like Sony* Pictures ULTRA, FandangoNOW* and iQiyi* coming in 2017, your 7th Gen-based PC is now a 4K theater. VR and Gaming: With virtual reality and gaming growing at an incredible pace, the need for computing horsepower everywhere has never been more essential. In gaming and VR, the processor not only provides the power to drive these system-intensive games, but is also responsible for important capabilities like particle physics and object persistence. That’s a technical way of saying it makes objects look and act more lifelike – creating a completely immersive experience. Intel puts the reality in virtual reality. And for those gamers on the go? The new Intel® Iris™ Plus graphics in laptops7 makes it possible to take a game like Overwatch* with you and play in full HD. Enhanced Content Creation: Content creators will have the ability to do more from both a creativity and productivity standpoint. 7th Gen Intel Core processors with Intel® HD7 and Intel® Iris Plus Graphics7 provide laptops the power and graphics to create, stitch and share 4K UHD 360-degree videos and simultaneously transfer and display dual 4K video and fast storage through a single port and cable with Thunderbolt™ 3. No matter who it’s for – the business focused on manageability, authentication and security; the enthusiast demanding the best possible VR and gaming rig; the movie buff wanting to take premium 4K UHD entertainment on the go; or the professional who requires the power and reliability of a mobile workstation – Intel’s latest 7th Gen Intel Core processor has you covered. 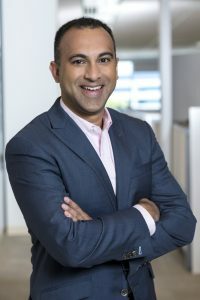 Navin Shenoy is senior vice president and general manager for the Client Computing Group at Intel Corporation. 1 Software and workloads used in performance tests may have been optimized for performance only on Intel microprocessors. Performance tests, such as SYSmark and MobileMark, are measured using specific computer systems, components, software, operations and functions. Any change to any of those factors may cause the results to vary. You should consult other information and performance tests to assist you in fully evaluating your contemplated purchases, including the performance of that product when combined with other products. For more complete information, visit http://www.intel.com/benchmarks. 7 Intel technologies’ features and benefits depend on system configuration and may require enabled hardware, software or service activation. Performance varies depending on system configuration. No computer system can be absolutely secure. Check with your system manufacturer or retailer or learn more at intel.com. Streaming services may require subscription to the service provider services. 10 Assuming the first factor is a 10-character password in a 94 character alphabet using NIST SP 800.63-2 estimates for password guessing entropy, the password is an aggregate of characters selected at random from the alphabet, the second factor is a fingerprint, the third factor is a mobile phone, the fingerprint and mobile phone factors have the same entropy as the password factor, a hardware-based Trusted Execution Environment allows for the multiple factors to be aggregated, the factors are independent, not spoofable, operate in an isolated computation environment where each factor’s privacy is preserved, are unrelated to each other, and the system when protected by the multiple authentication factors requires that all factors be validated before access is granted to the protected resource. Intel, the Intel logo, Intel Core, Intel vPro, Xeon, Iris and Thunderbolt are trademarks of Intel Corporation in the U.S. and/or other countries.